Yes, Tokyo, home to the world’s most extensive urban rail network, has one station named “Tokyo”. If you’ve driven to the San Juans, especially in summer, you know the horror: scheduling a ferry slot months in advance, struggling with an overloaded website when the slots are released, allotting plenty of extra time in case you hit traffic, and showing up no later than 45 minutes before sailing. And then you fork over $30-$50 each way (plus the passenger fare) to haul the car on board. Last Labor Day weekend, I tried a different way: public transit all the way from Seattle, to join my party already on Orcas Island with the car. Google Maps told me to leave downtown Seattle at 3:15pm to make the 7:20 sailing from Anacortes. It’s a 90 minute drive under ideal conditions, though if you’re driving to the islands you’d best leave some extra time. That same uncertainty did me in, even on the bus. It will surprise no Snohomish County commuter that my 512 capitulated to the traffic. The HOV lane failed, and even though I’d departed 15 minutes earlier than recommended, I didn’t come close to making the (hourly) Skagit Transit 90X to Mt. Vernon. I grabbed a sandwich and schemed to get as close to possible to the ferry before switching to Lyft. Gene Balk has a typically informative column ($) about who is taking to transit to work these days. University professors, housekeepers, and computer programmers have the highest transit share of any professions in Seattle. He astutely points out how much this has to do with where jobs are located. Seattle is incredibly fortunate that Amazon continues to place the vast majority of its office jobs in the center city. Someone might use that as a story of how transit is now just a “hipster” phenomenon, but professional definitions are arbitrary — I don’t know the difference between “computer programmer” and “software developer” in this context. Meanwhile, less arbitrary divisions, like the income chart above, show that low income people remain, in both absolute and relative terms, the biggest users of transit in the region. Moreover, transit’s mode share is relatively stable across income boundaries. 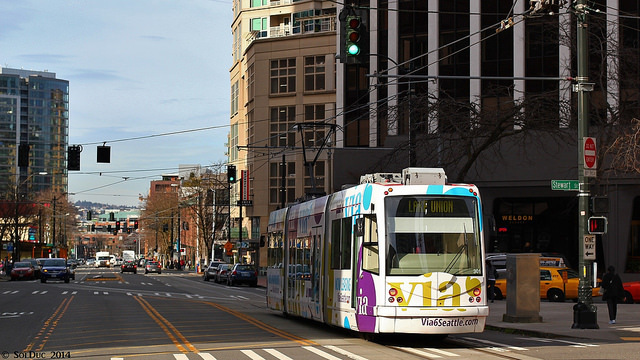 Broadly speaking, we’ve made transit an attractive option, and this creates a positive feedback loop. Creating higher-income riders creates stakeholders with more political power — which leads to better and more attractive transit. 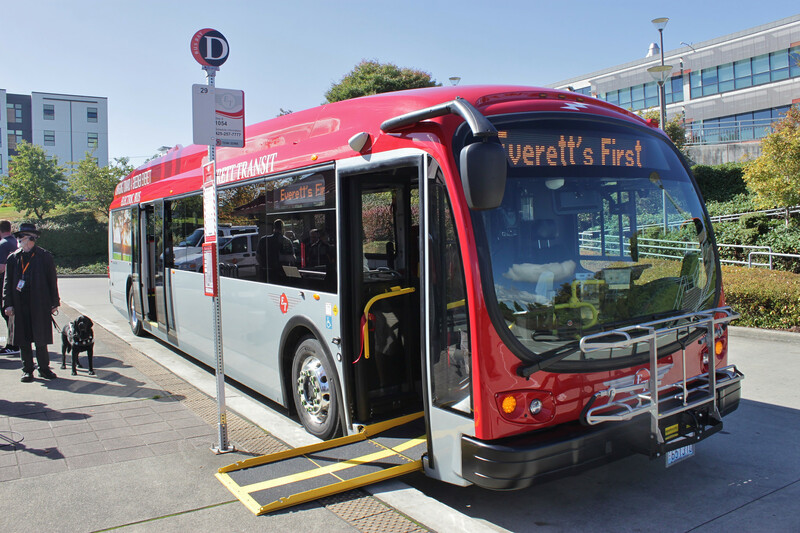 Everett Transit, on the verge of a major network restructure, brought its first electric battery bus into service earlier this week. 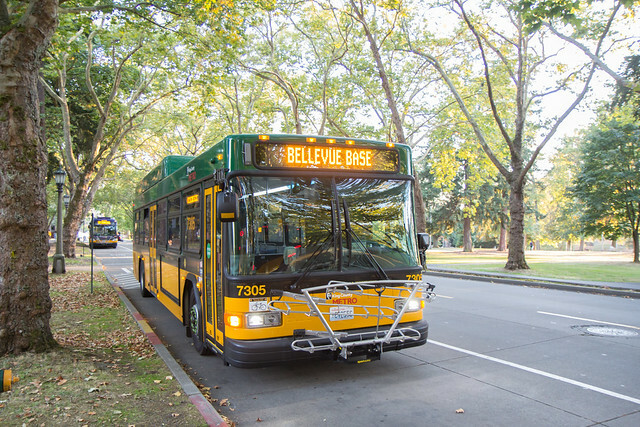 The bus, a 42-foot Proterra Catalyst E2, is identical to the newer generation of electric battery buses operated by Metro in Bellevue and has been one of the most popular electric models for the past several years. The bus can carry 31 seated passengers and about 18 standees, can handle grades of 10% at 40 miles per hour, and can run for 250 miles on a single charge (which takes 2.5 hours to complete). Similar Proterra buses have been making trial runs in Bellingham for the Whatcom Transportation Authority and a pair were recently delivered to Kitsap Transit and Pierce Transit. 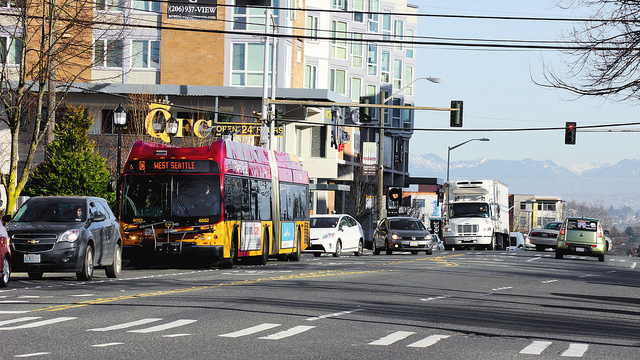 The new bus is the first of four that will enter service by the end of the year and will primarily run on Route 7, the system’s flagship route that runs along Broadway and Evergreen Way—Everett’s two busiest transit corridors. 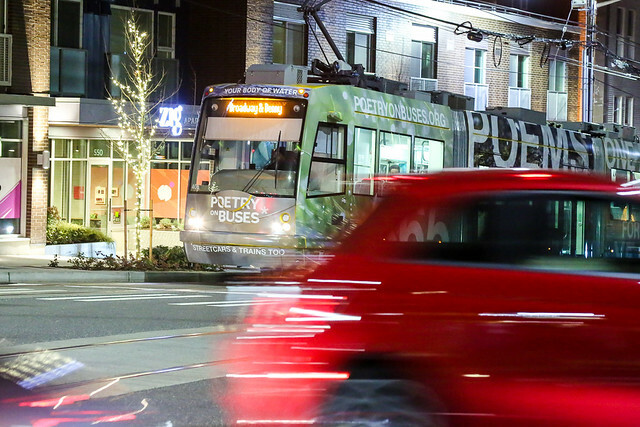 It was funded by a $3.4 million Low or No Emission Vehicle grant awarded by the Federal Transit Administration in 2016 and matched by funds from the agency. Relatedly, the City Council reviewed the UW Master Plan. They want less parking and more affordable housing. 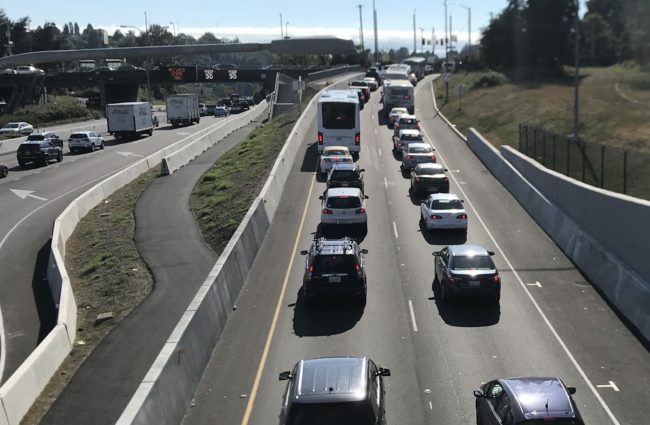 Rainier Freeway Station, at I-90 and Rainier will close for 5 years beginning Monday, September 22, for East Link Construction. 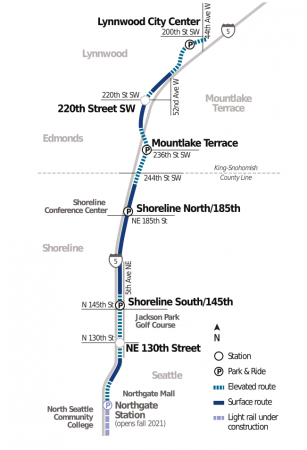 You can read Sound Transit’s explainer for more details. 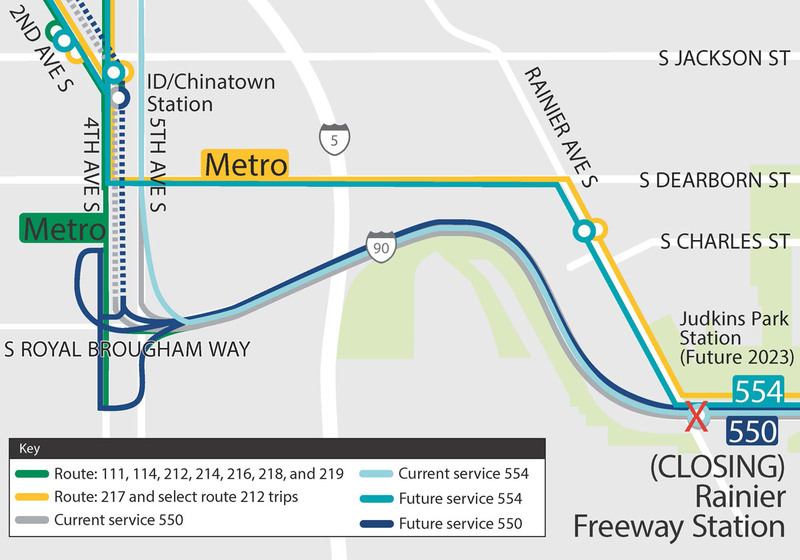 Most routes (111, 114, 212, 214, 216, 218, and 219) will bypass the station and head into downtown, while the 554, 217, and some 212 trips will be detoured via Rainier Ave and S Dearborn St to provide service coverage to the North Rainier area. Needless to say the routes that remain on I-90 will be faster for riders going to and from the Eastside. 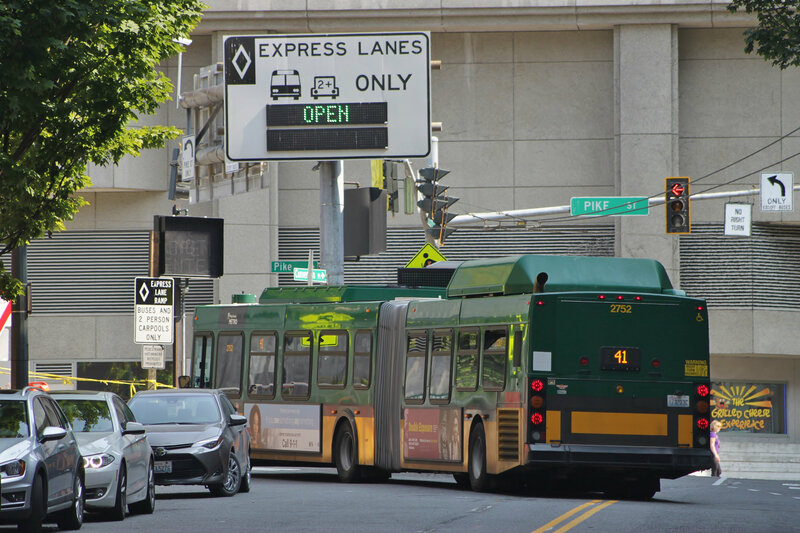 Seattle DOT is, however, mitigating some of the impact for some routes by making a stretch of 4th Avenue S into an all-day bus lane. 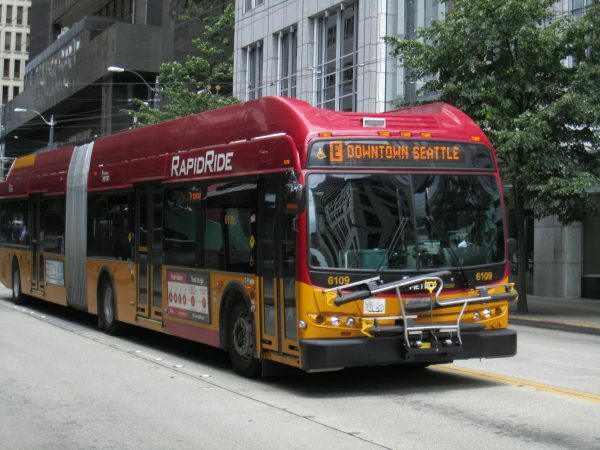 Contributor Jason Shindler wrote a guest piece for us in 2016 previewing some of these changes and suggesting some “radical changes” that could speed up buses traveling on I-90. 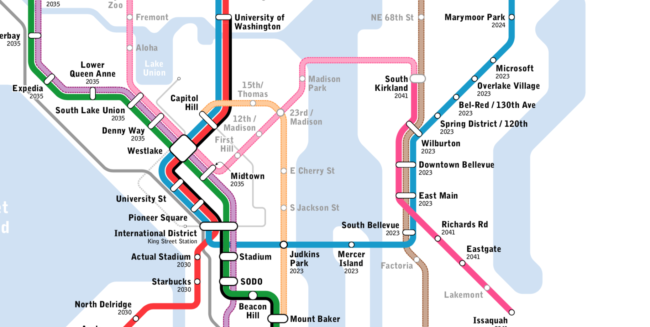 In 2023, the station will re-open to serve East Link light rail exclusively. At that time, all I-90 buses coming in to Seattle will terminate at either Mercer Island (with limitations) or South Bellevue. Dublin is reimagining its bus network. 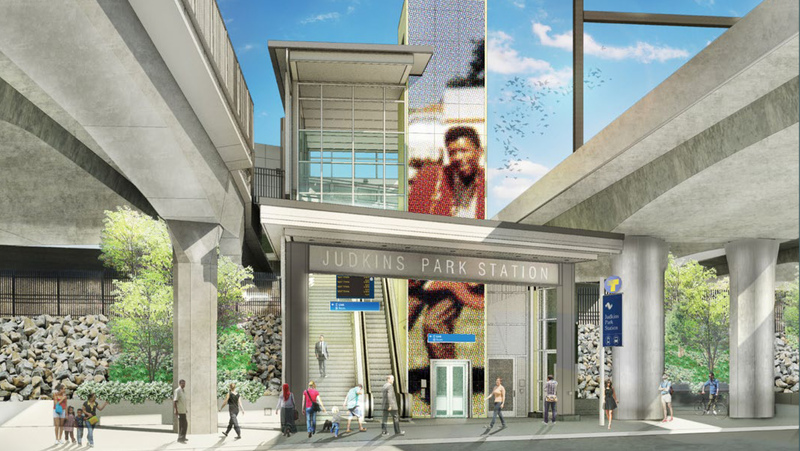 Mike Lindblom writes a fair deep dive on the 85th St BRT Station ($). 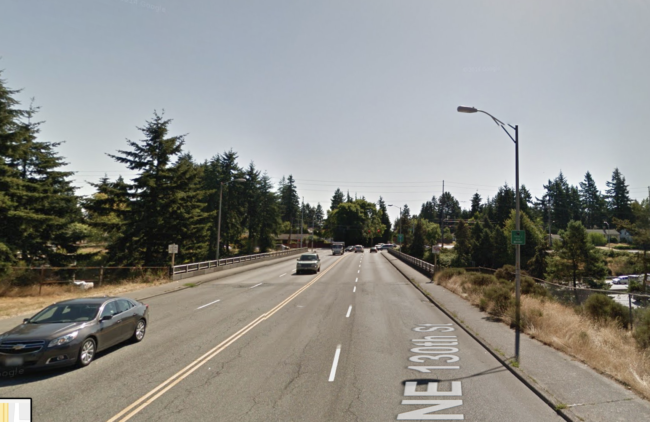 ST to talk with Lower Queen Anne about station locations Sep. 20. The pro-CCC coalition ($) is impressively broad. The bus stop improvement plan was scuttled by privacy concerns. “Adaptive signals” are not great. Nuisance lawsuit against ST3 car tabs thrown out. Swift Blue Line going back to 10 minute headways this month. SDOT Director is a good gig, if not with great job security. Meetings on 145th/SR522 BRT this month. Some riders not happy with Access. 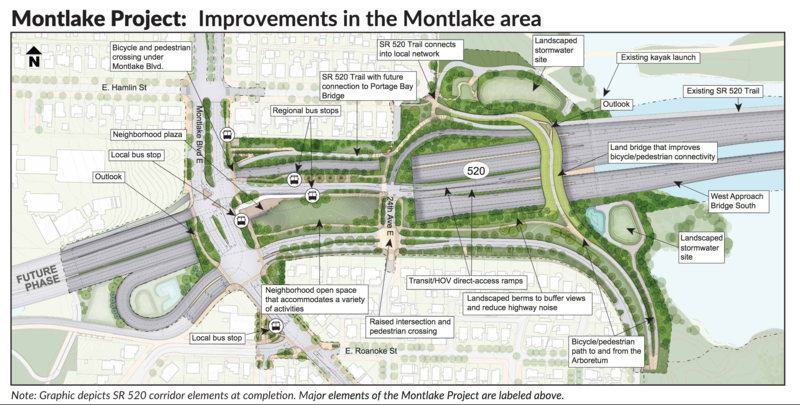 WSDOT trying several things ($) to reduce I-405 congestion. 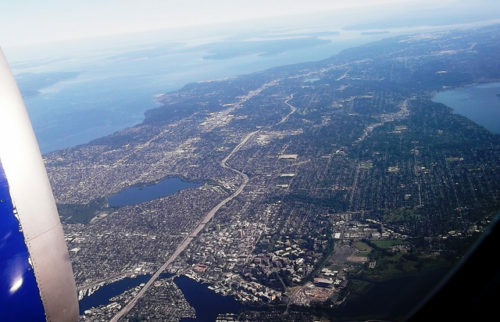 Puget Sound is still driving more, but less per person. Cascade coalesces a campaign around a limited set of projects, which is wise. SDOT pitting Eastlake bike lanes against on-street parking. It’s the single family zones where Seattle is losing tree cover. 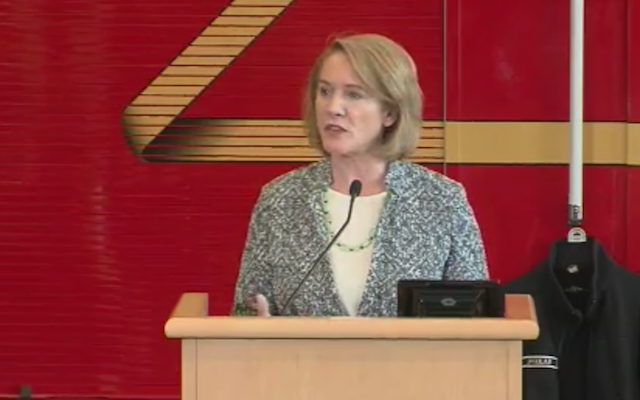 Seattle may tax Uber and Lyft, at least in downtown. Lime may bring its scooters and bikes to Tacoma. We endorsed Joe Nguyen in the 34th District, but Shannon Braddock’s position on car tabs is totally reasonable. 360 more units for Redmond. ST hiring a communications intern. As ST3 got closer, more advocates began asking for the station to be added to the plans. 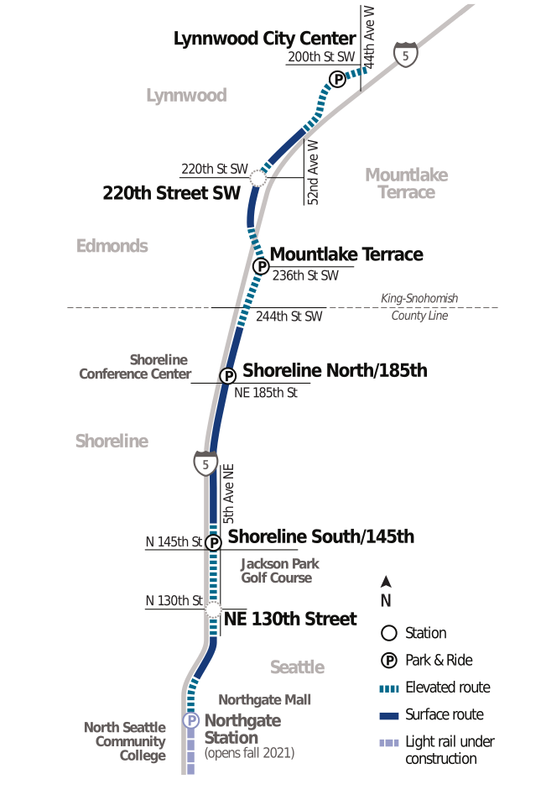 When the draft ST3 plan was released in April of 2016, the 130th station was listed as “provisional.” Then, after a public process that included some vigorous advocacy from folks including Seattle City Councilmember Debra Juarez, who represents North Seattle’s District 5, the station was added in but deferred to 2031. The 2031 date didn’t really make anyone happy. Adding the station after Lynnwood Link was up and running would have been expensive and disruptive. 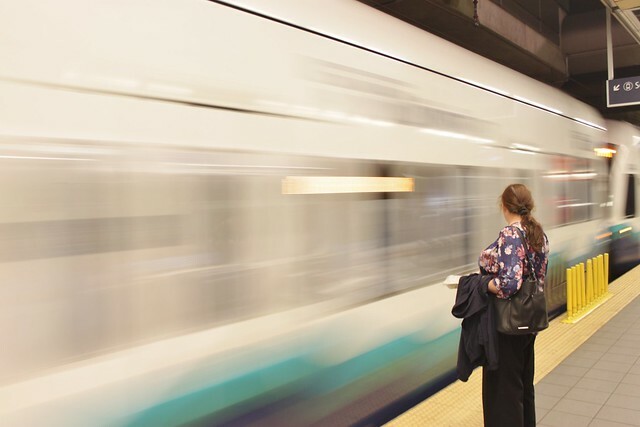 But it was seen as too risky, both in terms of Lynnwood’s timeline and federal funding, to add the station concurrently with the rest of the Lynnwood extension. 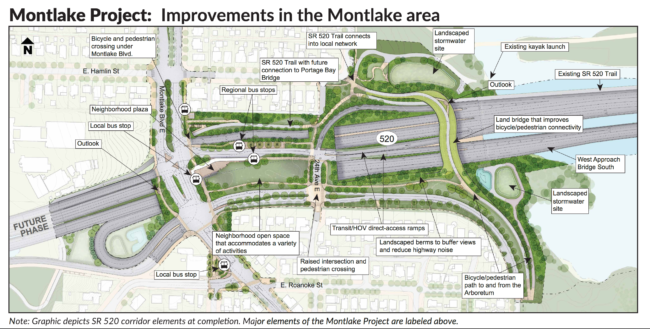 With Lynnwood Link pushed out to 2024, staff appear more confident that they can squeeze it in. It’s not time to pop the Champagne corks up in Pinehurst just yet. The resolution calls the preliminary engineering proposal a “due diligence effort” to “help determine the viability of accelerating final design and construction of the station to be sufficiently complete by 2024 concurrent with [Lynnwood Link] to avoid or minimize service disruptions.” But this is still optimistic news for a project that has had its share of setbacks. Sound Transit’s new schedule books are out. The September 22 service changes include some bad news and little bits of good news. Seven ST Express bus routes, including the two with the highest ridership (routes 550 and 545), are losing trips. Routes 511 and 580 are the only routes gaining trips. Some routes are losing a little span of service, and some are gaining. Route 510 is losing two trips, both in the afternoon peak, with trips from 3:55 to 5:35 becoming more spread out. Route 511, however, is gaining a trip, improving frequency and altering schedule times from 4:06 pm to 6:18 pm. Route 513 is losing one northbound afternoon trip, impacting the timing of all northbound 513 runs. On the bright side, the last trip will start five minutes later, extending span of service.